Anyone ever swallowed some Lego, or wondered if their children have? These guys have done some research. Never swallowed LEGO but did get a Playmobile milk bottle stuck up my nose, which blocked my nostril and I had to have it removed in A&E (I was about 5!). I know, I know - that'll teach me to play with inferior brands (but I had LEGO, too!). I have a similar tale! Except mine was a 1x1 round brick up my nose. I can't remember how it was extracted but I do recall it being yellow! My youngest girl also had a Lego insertion incident. She had a cylinder like @Huw up her nose when she was 5! We didn't find it for a week, whilst her nose got more and more snotty! A quick trip to the doctors sorted it out eventually! We didn't keep the cylinder. Maybe these should be combined? What is with kids and snorting Lego? Are they gonna have to put "inhalation hazard" on the boxes now? ^ I think that Would fit under the “small pieces” warning. Anyway, I did swallow a transparant stud when I was 9 or 10, because we were in holiday in Prague, so I didn’t have a brick separator in hand. By the way, professor Bruce Lee? Someone parents were fans. Before or after it was up your nose? Had an 7 year old swallow a stud before however the largest thing he swallowed was a 1 inch solid glass lens 6 months later. That was a fun night! When I was young (but old enough that I probably should have known better… 5, I think) I remember pulling a minifig hook hand off a figure using my teeth and swallowing it by accident. Forget what color hook or from what figure specifically. That’s the only family memory of LEGO swallowing I remember. Neither me nor my siblings ever had the LEGO up the nose problem. Our now 18 year old dog Cider did chew up a green Bionicle Kakama mask when she was a puppy, but it was still intact enough to know she didn’t swallow any of it, it was just teething. I also did put other LEGO parts in my mouth though, sometimes to their detriment… I doubt the chrome coating on so many of my family’s Royal Knights style broadswords would’ve worn away quite as quickly otherwise. I was the stingy kid in the neighbourhood. I tried to stop others from swallowing my precious collection. Nothing's changed. 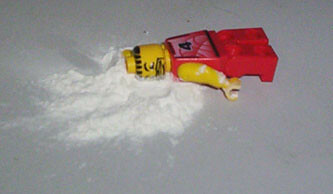 What is with kids and snorting Lego? They did the test on adults. Now do it on children, where it is probably more likely to happen in real life. I think I would prefer to pass a nice rounded head than a 1x1 brick, even though a 1x1 is slightly smaller. Why are these pieces sticky? I would take solace in the pet dander and kitty litter. When I was a young lad, I’d sometimes use my teeth to get flat pieces off of Lego plates. I remember one instance caused me to nearly swallow one and from the day forward, I never bit another Lego again. Those would partially digest causing M*gablockage. Yes I went there. At least M*gabloks comes out in exactly the same condition as it went in: crap. Maybe this would be a good thread to merge with the whole, "using Lego bags for food storage" thread? Nothing tops off a nice baked potato in a Lego bag like some 1x1 round plates! How did this not make the news on this site? As a researcher, I find the cited paper to be a welcome change.